Singapore is a city filled with stunning art, beautiful gardens and cutting edge architecture. Check into one of these awesome hotels and immerse yourself in the hip city culture. Singapore is a hot destination for shopping, nightlife, dining and cultural attractions. Visit the Botanical Gardens which feature rare birds and flowers. Take a river cruise to view the impressive buildings from the water. Visit Sri Veeramakaliamman Temple in Little India, Universal Studios Theme Park on Sentosa Island and go on a Night Safari at the zoo. 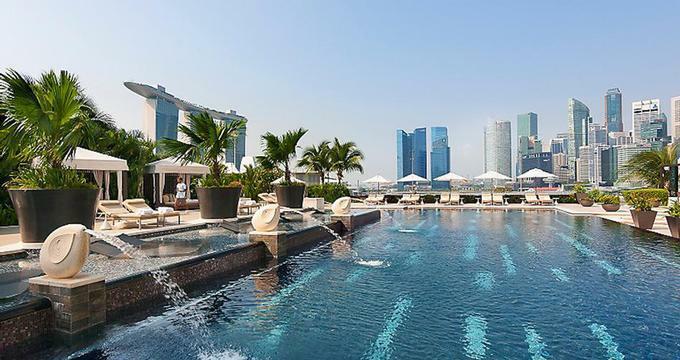 If you want some of the best views of Singapore combined with five star service, check into the Mandarin Oriental Singapore which has a beautiful spa and a spectacular outdoor pool with plush poolside cabanas and awesome city views. All of the guest room have scenic city views. Ask for the Premier Ocean Room which overlooks the Benjamin Sheares Bridge and the famous Singapore Flyer. The rooms are decorated with soft neutral colors which merge contemporary style with Oriental influences. Each room features Asian artwork, elegant wood furnishings and a beautiful desk with a marble top. Glass-enclosed bathrooms feature cozy stand-alone baths, perfect for a soothing bath after a day out in the city. The walk-in showers and wood-panelled vanity areas complete the luxury bathroom design. Floor-to-ceiling window make you feel like you are floating above the river and the city. The suites are located on the highest floors of the hotel and provide access to the exclusive Oriental Club Lounge. The lounge offers a number of great benefits, including Champagne breakfast and afternoon tea daily, evening cocktails and hors d'oeuvres, all-day soft beverages and many other perks. A relaxing retreat in the heart of the city, the spa offers a serene environment and an extensive menu of services. There are 8 treatment suites, including 2 designed especially for couples. Each signature treatment begins with a private therapist consultation and includes a relaxing body massage and exercise guidance. Try the "Fragrant Pearl" which includes a body scrub, body wrap and a full body massage, a combination of Swedish and Shiatsu massage. Be sure to allow plenty of time to relax next to the scenic outdoor pool, swim a few laps and enjoy views of the city. There are several dining options, including Dolce Vita which serves Italian specialties, Cherry Garden which offers Cantonese cuisine, Melt where you can eat as much as you want at the International Buffet, Morton's Steakhouse and Wasabi Bistro serving Sushi & Japanese Fare. 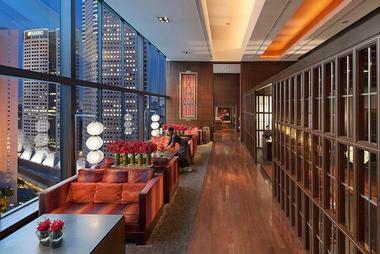 There are two bars, both with spectacular city views: Alexis and Bay@5 bar. Rooms start at SGD 339 per night. The décor and art at the New Majestic Hotel in Singapore is fun, airy and cutting age, inviting you to play and relax surrounded by bold colors, curvy lines and unique amenities like side-by-side bathtubs and windows above the restaurant that let you look at people swimming in the pool above. The hotel is located in Chinatown, giving you access to many attractions in the area, including Chinatown Heritage Center and Thian Hock Keng Temple. Choose from 6 different types of layouts, each featuring individual design and décor, showcasing a mix of vintage and designer furniture. There are rooms with private gardens, and attic-style rooms with loft beds in six-meter high ceilings. Premier Pool Rooms have views of the pool, unique art and rain showers. Junior Lifestyle rooms have mini-lofts (ask for the one with a private outdoor garden). The Premier Garden Rooms have a private verandah and vintage cast-iron bathtubs. The Aqua Room is for those who like to indulge in long relaxing baths. The room overlooks Bukit Pasoh Road and has a bathtub in the center of the room. There are five other Aqua-style rooms which were personalized by cutting edge Asian designers. Attic rooms feature incredible vintage cast-iron bathtubs and ladders access to a queen-sized loft beds. The most unique feature of the Majestic restaurant is the unique ceiling that lets you peak up though ceiling windows into the hotel swimming pool above. Cozy alcoves are perfect for a romantic dinner date – they provide plenty of privacy. The restaurant serves delicious contemporary Cantonese cuisine where you can order amazing Roast Duck, Deep-fried Baby Squid and great dim sum. Rooms start at $175 USD per night. The New Majestic is an Unlisted Collection hotel. The Guest Experience Ambassador is available for a free consultation to help you plan the ultimate sightseeing itinerary during your stay in Singapore. If you want to see and be seen at one of the hottest new bars in Singapore, head to Lantern at The Fullerton Bay Hotel. 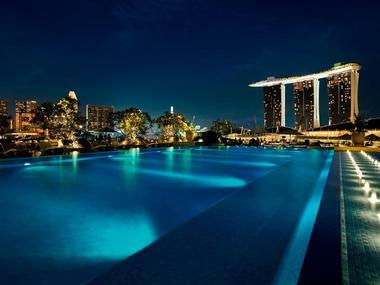 The rooftop pool and bar offer visitors spectacular views of the city skyline and the Marina Bay waterfront. Sip signature coctails, go for a swim in the pool and relax in plush loungechairs. At sunset, the pool trasforms into a unique rooftop bar that's become a popular hangout spot in the city. Guest rooms and luxury suites at the hotel are decorated with natural tones, combined with rosewood, leather and chrome. Floor-to-ceiling make you feel like you are floating above the city. A private balcony is a nice touch and makes you feel more connected to the beat of the town. Head to the gym to stay in shape on the road. Work out on the cardio machines with views of the city skyline through floor-to-ceiling windows, and stretch on the outdoor deck where you can do yoga and Pilates. In addition to snacks served at the rooftop bar, the hotel offers several restaurants and lounges serving a variety of flavors, including Japanese, Italian, Indian and Chinese cuisine. Rooms start at SGD 350 per night (+65 6333 8388). 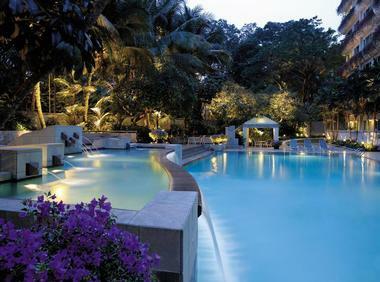 Singapore's first CHI, The Spa at Shangri-La Hotel, Singapore is officially open. The idea was to create a soothing retreat in the heart of the bustling city. The spa is situated on 15 tropical acres, offering guests an oasis of peace and rejuvenation. Treatments are inspired by the traditional Chinese philosophy which believes that "chi", the universal life force, much flow freely in a healthy body. There are nine treatment rooms and a wide selection of services, including hot stone massage, reflexology, mud wraps, full body massages and more. Local ingredients are utilized in the treatments. A series of signature journeys are also offered, such as the CHI Retreat, a two-hour CHI body scrub and relaxation massage. There are three treatment rooms designed especially for couples. 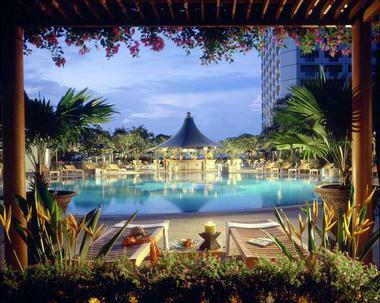 Fairmont Singapore is a stylish hotel with a spa, a choice of guest accommodations and many restaurants. The property is located in the center of the city, offering an ideal location for business travelers and vacationers alike. The hotel has an outdoor pool where you can relax in one of the lounge chairs with a drink. Singapore is a fun destination, offering a wide variety of shopping, cultural attractions and unique restaurants. The hotel is next to two metro stops, making it easy to explore all parts of the city. Choose from 769 luxuriously appointed accommodations with private balconies and chic bathrooms. Rooms and suites on the top floors have the best views. Ask for an Executive Club room so that you will have access to the private lounge with complimentary daily breakfast and evening cocktail hour with hors d'oeuvres. The hotel offers 15 restaurants and bars serving flavors from around the world. Willow Stream Spa is one of the largest spas in Asia, offering a diverse menu of services and extensive spa and fitness facilities. Room rates start at 360 SGD per night. A 70-ton part fish, part lion statue overlooks Singapore’s Marina Bay, paying homage to the Lion City’s humble beginnings as a fishing village. Now a brilliant cosmopolitan blend of past and future, this island city-state at the tip of the Malay Peninsula is a modern-day mecca for international travelers. Visitors can explore 50,000 toys from 40 countries at the Mint Toy Museum, peruse high-value antiques at the ironically named Changi Junk Store, and view the surreal collection of Supertrees at Gardens by the Bay. Jurong Bird Park fascinates with exciting exhibits in the largest bird park of its kind in Asia. Lau Pa Sat, the markets of all markets, is a worthwhile visit for the architecture alone. These are among 25 must-do activities that characterize Singapore and ensure travelers see the best the city has to offer. 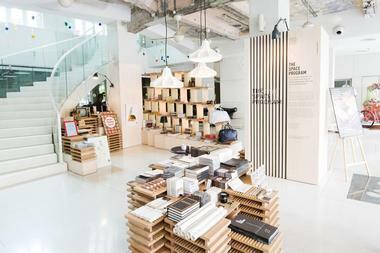 The ArtScience Museum was established in 2011 to explore the creative methods at the center of science, art, culture, and technology and how they are used to shape society. Situated along the Marina Bay waterfront, the museum features 21 galleries and has been the host of numerous international exhibits of well-known icons. These include Titanic, Andy Warhol: 15 Minutes Eternal, Dinosaurs: Dawn to Extinction, and Da Vinci: Shaping the Future. This daring lotus-inspired museum also showcases a wealth of permanent exhibitions such as Into the Wild: An Immersive Virtual Adventure. This cutting-edge exhibition transports visitors into a virtual rainforest where they can take an active role in replanting Southeast Asia’s rainforests. Located in a 62 million dollar complex in the vibrant Chinatown area of Singapore is the Buddha Tooth Relic Temple & Museum. It’s one of the most prominent attractions in the country not only because of its exceptional architecture, but also because it is said to house a fragment of a tooth from the Buddha. This relic was discovered in Myanmar in 1980 in a collapsed stupa. Viewing opportunities of this historic relic change often, so it’s important to check the website before heading to the temple. In addition to the tooth, the temple features several floors of nagas, Buddha statues, and remarkable ceremonial spaces to meditate and pray. The name is quite misleading as the Changi Junk Store houses almost no actual junk, but rather high-value antiques of various time periods, styles, and cultures. This quaint, decades-old store is piled high with antiques recovered from all over the world. It’s crammed with so much stuff that visitors have to enter and exit single file. Owned by collector and dealer Pak Haji Basman, patrons will notice his collection has everything from Peranakan rice baskets to coins from the colonial era. Relics such as knives of Indonesian princes, dolls made of Ming dynasty coins, WWI bayonets, and Qing dynasty porcelain are just a few of the impressive antiquities found here. Fort Canning Park is an exemplary hilltop landmark that has observed several of Singapore’s historic turning points. It was once the location of the palaces of the Malay kings during the 14th century and the headquarters of the Far East Command Center and British Army Barracks during WWII. Today, this expansive park with its lush greenery serves as a venue for various celebrations and events such as theatre productions, concerts, and festivals. It offers a wealth of attractions like the Fort Canning Spice Garden, Sally Port, the Archeological Dig and Expedition Area, Princess Pond, and the ASEAN Sculpture Garden. A park highlight is touring the Battlebox, located 30 feet beneath the park. Gardens by the Bay is a landscaping project situated along Singapore’s Marina Bay. It was created as a means to beautify the marina and to assist in transforming this compressed city into a “city in the garden.” Its futuristic design offers an otherworldly appearance, with its most defining feature being a collection of 18 Supertrees. These man-made 80 to 160-foot-tall tree frames feature both green technology and greenery with approximately 200 species of ferns, orchids, and other tropical climbers creating a colorful and lush skin. Visitors can view the space up-close via the 72-foot-high OGBC Skyway. Additionally, two gigantic greenhouses and numerous outdoor lakes and gardens occupy the space. Haw Par Villa, affectionately known as a “Buddhist amusement park,” was built in 1937, and offers an educational yet graphic journey through a mixture of Confucianism, Buddhism, and Taoism. It speaks to the fabric of traditional Chinese life, spirituality, morality, and legend as well as a modicum of references to Singaporean history through hundreds of life-size plaster dioramas and more than 1,000 statues. These include the Ten Courts of Hell Cave, sumo wrestlers, and the Monkey King. There is also a gorgeous and tranquil turtle and koi pond, where visitors can relax while feeding the fish amongst the pagodas, bridges and, a little oddly, the Statue of Liberty. The Japanese Cemetery Park was created in 1891, and prostitutes, soldiers, merchants, and businessmen alike are buried here. Some of the most notable people who were laid to rest here are Futabatei Shimei, a leader of realism in Japanese literature, and Ueyama Kantaro, the son of the inventor of the mosquito coil. There are also several memorials and gravestones created by prisoners of war for deceased soldiers and generals within the park. The cemetery also boasts a prayer temple and garden. Since 1969, caretaker Lim Geok Qi has maintained these grounds and acts as a tour guide for visitors who would like to learn about the rich but complicated history of Singapore-Japan relations. Built in 1971, Jurong Bird Park is one of the most famous bird sanctuaries in the world with some of the biggest free-flying aviaries known to man. This nearly 50-acre bird park is the largest of its kind in Asia. The habitats displayed here reflect the naturalistic environments of over 5,000 birds from more than 400 different species. They feature award-winning exhibits including the largest walk-in aviary, the Waterfall Aviary with its 98-foot-tall waterfall, over 100 plant species, and more than 600 birds. The 9-story-high Lory Loft, which houses Australian natives as well as the Jungle Jewels, Penguin Coast, Flamingo Lake, and Pelican Cove are also exciting exhibits to view. Katong Antique House is a two-story filled-to-the-brim antique museum that beautifully preserves the dwindling remnants of the unique, mixed culture of the Peranakan people. Owned and operated by fourth-generation Peranakan Mr. Peter Wee, this intricately decorated antique house serves as part museum for Baba Nyonya artifacts and part store selling Peranakan wares. Adorning the yellow painted and green tiled walls are various Peranakan portraits and prints, while the space is filled with Peranakan furniture, costumes, and crockery. Visitors will also find an array of baju panjang (long dresses) kasot manek (beautiful handmade, beaded shoes with motifs of flowers, fish, dragons, and phoenixes) as well as batik sarongs. Lau Pa Sat is the market of all markets, a perfect blend of impressive architecture and a delectable local cuisine. Constructed in the 19th century, this Singapore landmark was named a national monument in 1973. Nestled in the heart of the financial district, it was originally built by renowned architect George Coleman, but was later reconstructed by James MacRitchie, who kept its octagonal shape and ornamental columns. He also added a cast-iron supporting structure and magnificent clock tower. Today, it also features fretted eaves, soaring arches, and narrow Victorian columns adorned with intricate filigree work and serves as a hawker center providing the best local fare as well as ice-cold beer. The Mint Toy Museum is located in downtown Singapore amongst an array of finance buildings of glass and steel as well as chic clubs. The collection is vast, with more than 50,000 toys from over 40 countries created during most of the 20th century. Batman, Dan Dare, Mickey Mouse, the Green Lantern, and Robby Robot are just a few of the childhood favorites within the museum. Many of the characters have estimated value tags, such as a Popeye character worth a reported USD14,000. Other tags mention if the toy is one-of-a-kind and, if not, they’ll say how many others are still out there. An architectural and cultural landmark, the National Museum of Singapore is located within a 19th century colonial building featuring a history that dates back to 1887. It is the oldest museum in the nation and uses cutting-edge technology to showcase the nation’s development and legacy. Their permanent collections include Art of the Rehearsal, a video installation depicting Singaporean dancers from differing cultures practicing their craft, Desire and Danger, and Growing Up, which provides a look at Singapore’s early years. The museum also hosts an array of events and activities throughout the year, such as visually stunning art installations, film screenings, performances, and recurring experiences like the famed Night Festival. The Night Safari opened in 1994 next to the Singapore Zoo, and is the first safari park in the world for nocturnal animals. It is more a wildlife park than an actual safari, featuring more than 2,500 animals from over 130 species. Many are indigenous to the region, like the Malayan tiger, Asian elephant, and Malayan tapir. The park comprises roughly 85 acres of dense rainforest. Fierce animals, such as leopards, can be viewed behind barriers while tamer animals like deer are able to roam freely throughout the park. Tram rides take visitors from the Himalayan foothills to equatorial Africa, highlighting the nocturnal animals of each distinctive area. The Peranakan Museum resides in the former Tao Nan Chinese School built in 1912; its purpose is to explore the culture of the Peranakan communities present in Southeast Asia. This charming museum offers one of the best and most extensive collections of Peranakan objects. It features three floors of galleries that exhibit the extraordinary visual arts and cultural traditions of the Peranakans. The galleries showcase the origins, language, fashion, religion, food, weddings, and public life of the Peranakan people. Among the museum’s highlights are a beadwork tablecloth with more than a million glass beads, wedding beds with ornately carved fertility symbols, and mosaic portraits of Mr. and Mrs. Tan Soo Bin. Science Centre Singapore is an enriching attraction that houses the biggest collection of educational objects dedicated to science in Singapore. With 14 galleries featuring thousands of interactive exhibits, it’s the perfect place to inspire up-and-coming world-renowned Singaporean researchers. There are 20 permanent exhibitions such as Defending Science, showcasing the latest in flight, surveillance, radar, and armor used in battle, and the Ecogarden, featuring a wide array of plants that grow naturally without any special aid. Visitors will also have the opportunity to power an engine using the heat from their palm and explore the different layers of the earth’s surface. Singapore Botanic Gardens is the oldest of its kind in the city and the first UNESCO World Heritage Site in the country. Once a plantation, these 60 acres of land have been transformed into a recreational garden. A leading center for horticultural and botanical research, it is also the perfect place for a scenic jog or a tranquil picnic. A highlight is the National Orchid Garden, which features the largest orchid display in the world with more than 60,000 orchids and plants. Kids can learn about plant life while playing in their Jacob Ballas Children’s Garden as well as explore the SBG Heritage Museum, which boasts multimedia and interactive exhibits. The Singapore Flyer is a 540-foot-high giant observation wheel conceived of and designed by Dr. Kisho Kurokawa and DP Architects; it opened in 2008. Located in the center of downtown Marina Bay, it is the biggest of its kind in Asia, featuring 28 capsules, each with a 28-person capacity. Each revolution of the wheel takes roughly 30 minutes and offers incredible 360-degree views of the Marina Bay skyline with glimpses of the neighboring countries of Indonesia and Malaysia. Some of the most notable landmarks that can be seen are Merlion Park, the Singapore River, and Raffles Place. As a bonus, visitors can choose from their in-flight packages, which include fine dining, high tea, or champagne. Situated atop three 55-story-high hotel towers is the Singapore Rooftop Pool, the largest skyline swimming pool in the world. Located on the roof of the Marina Bay Sands Resort and designed by architect Moshe Safdie, the nearly 500-foot vanishing edge appears to abruptly cut off and disappear at 650 feet above the ground. While that might seem daunting, if not slightly scary, there is actually a trough-style basin beneath that collects the water and returns it to the pool. There is also a spa, bar, restaurant, observation deck, and botanical garden featuring 650 species of plants and 250 species of trees. The Singapore Zoo is an award-winning wildlife park situated on 65 acres of land and home to more than 300 species of mammals, reptiles, and birds. These include pygmy hippos, white tigers, and naked mole rats. Many of their tame animals are also allowed to roam freely throughout the park, allowing visitors an up-close and personal look as they stroll through the park. The zoo features 11 distinct zones that are distinguished by the animal’s country of origin or breed, such as the Frozen Tundra, Australasia, Primate Kingdom, and the Reptile Garden. Inuka, agile wallabies, and the first polar bear born in the tropics can all be found here. St. Joseph’s Church is the first Catholic church in Singapore featuring neo-Gothic architecture. Located in the bustling Central Business District, it is surrounded by glassy corporate buildings and crowded shopping centers. This charming white church was built in the shape of a Latin cross and became a national monument in 2005. Created by iconic architect D. McLeod Craik, the church is filled with Portuguese decorative tiles, marble statues, and alters, including an altar of Our Lady of Fatima and St. Anthony, both of which were created by Bertelli. The most prominent aspect is the original statue of Fatima, which was donated by Dr. Caetano Xavier Furtado, a Portuguese parishioner. The Sungei Buloh Wetlands Reserve is a truly unique and rare wildlife sanctuary in Singapore with a tropical rainforest feel more reminiscent of something found in Indonesia or Malaysia. It features a rich biodiversity and natural greenery that is unusual for a city; this is especially true around the mangroves. The trails cover more than 12,000 feet of space passing through forests and coastal areas filled with migratory birds. It’s a popular stopping point for more than 150 species of birds traveling as far away as northern China, Siberia, Alaska, and Australia. There are also many other peculiar fauna found here, such as the Malayan water monitor lizard. The Live Turtle and Tortoise Museum is located inside the Chinese Gardens, a park devoted to classic northern Chinese landscaping. It is home to over 800 tortoises and turtles from more than 50 distinct species. These terrapins showcase a colorful diversity with a mixture that includes mata-mata, soft shell turtles, and snake-headed turtles as they relax in tanks, pools, and ponds. Visitors are welcome to purchase vegetables in order to feed the turtles, but it is recommended to do so with care as these reptiles may mistake fingers for carrots. There is also a museum featuring terrapin-shaped furniture, ceramics, and dishes. With a tropical rainforest climate and 92 inches of rainfall each year, it’s no surprise that Singapore would have a collection of umbrella-covered trees. Located on Hindoo Road in the Little India neighborhood, visitors will notice five colorful umbrella trees featuring a palate of blue, purple, red, orange, and yellow. Local artist Mathalia Budiman created this rain reprieve as part of an art installation project in a small public park space. Each of the trees provide a large green cushion area that rises up from the ground, allowing passerbys to grab a seat and relax as they escape the rain or the harsh sun.